Being in development for over 3 years, this is the last chapter of the next generation choral series from Strezov Sampling. Starting with WOTAN, the lowest and probably the most influential male choir ever sampled, FREYJA – the first sampled choir focused on the beauty of the female voice, and ÃRVA with boys and girls choir, RHODOPE 2 gives you a real authentic Bulgarian Bulgarian choir! A captivating and unique timbre of the voice, sampled by Strezov for the highest quality of reproduction and expression without any compromises in sound. 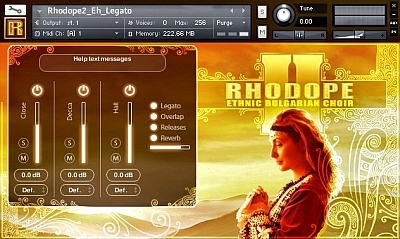 Including the revolutionary Syllabuilder engine (first introduced at WOTAN), True Polyphonic Legato, and the brand-new Agile Legato, which allows you to play a polyphonic legato with every word in the library, RHODOPE 2 benefits from every little secret found in more than four years of travel which led to the creation of the most playable and realistic choral libraries. phrasing with advanced word-editing functions. This allows you to get amazing results in a few seconds, as well as create new content samples with just a few mouse clicks. Create complete choir patterns within the GUI or combine different syllables and change them to add movements to your choir arrangements. Save and load lyric presets to quickly immerse yourself in the actual composition or enhance the tuning with the help of certain words. All samples have their own natural attack. However, if you want to increase it, Syllabuilder Engine allows you to set individual attack, release, volume, and offset values ââfor each area independently. Syllabuilder Agile Legato not only allows the user to play legato with every available syllable in the library, but also has an intelligent voice accompaniment that contains a polyphonic recording in just one patch. In other words: hold the chord to the left, play the melody with your right hand, and all this will be connected with legato transitions. This powerful feature is controlled by the most common MIDI controller â the sustain pedal.